Obituary for Arthur Mae Wingard | Carter Funeral Homes, Inc.
Arthur Mae Wingard was born October 19, 1930 to Ethel (nee Woods) and Willie F. Newberry in Goshen, AL. She transitioned from labor to reward on June 21, 2018 at her home in Troy, OH. She attended Goshen High School and later graduated from Cosmetology School in Cleveland. She was a managing cosmetologist for 35+ years and operated “Wingards House of Beauty” during the 60’s and 70’s. She also worked at Moen and York International in Elyria, retiring from York Int’l. Arthur Mae was joined in Holy matrimony to Jimmie Lee Wingard in 1948. Two children were born from this union. At an early age, Arthur Mae gave her life to Christ and joined Goshen Baptist Church. She later moved to Bessemer, AL then to Elyria in 1956 where she joined Second Baptist Church and was a faithful member until her move to Troy in 2011. In Troy, she joined New Life Baptist then Zion Baptist Church under the pastorage of Joseph Baldwin, Jr.
At Second Baptist, Arthur Mae was a member of the Senior Choir, the Outreach Choir, Saturday Morning Bible Study and Usher Board #2. She also served on the Usher Board at Zion Baptist until her health began to fail. Arthur Mae was a former member of the Tri-City Beauticians Club and the Alabama Club. 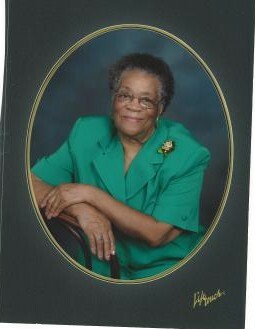 She leaves to cherish her memory her daughter Shirley (Willie) Wingard-Robinson, brother Rev. Willie (Gerri) Newberry, Jr.; 5 grandchildren: Marvin (Amy) Major, Sr., Stephanie Maley, Dorian, Derrick and Keisa Wingard, 13 great-grandchildren, 4 great-great grandchildren, special friends Alice Powell and Cora Roberts and a host of relatives and friends. She was preceded in death by her former husband Jimmie Lee Wingard, her parents Ethel and Willie Newberry, sisters Charity Williams and Annie Ruth Tellis, son Arthur Lee Wingard, 2 step-daughters Nealie Grace Porter and Esther Joe Stanton and grandson Andre Dion Major. Friends may call on Wednesday June 27, 2018 in the Second Baptist Church, 427 Chapman Lane, Elyria, OH 44035 from 10:00 a.m. until time of service at 11:00 a.m. Rev. Dr. Carl P. Small, pastor. Rev. Mark Taylor, pastor of Mt. Nebo, Officiant and Rev. Alvin Bailey, Eulogist pastor of Zion Baptist Church, Troy, OH. Burial in Resthaven Memory Gardens, Avon, OH 44011.